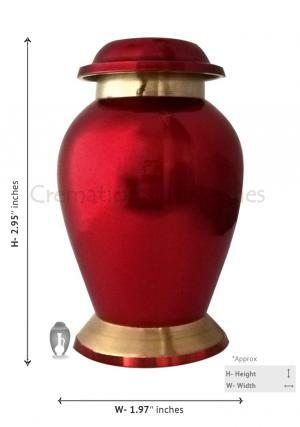 The small keepsake memorial urn with freezing ruby finish is made of high quality solid brass and intricately hand designed by skilled professionals to match the quality as well as nature of persons to honor the demised. Reading Ruby Keepsake Urn has a mirror finish on the top with a smooth texture with richness of ruby elaborated to be a mini sized keepsake urn. These keepsake urns for human ashes are used to memorize the ashes of your loved ones to preserve as well as to decorate in home to make their presence alive. The inexpensive funeral urns could be purchased in a good quantity to preserve ashes among the family members. 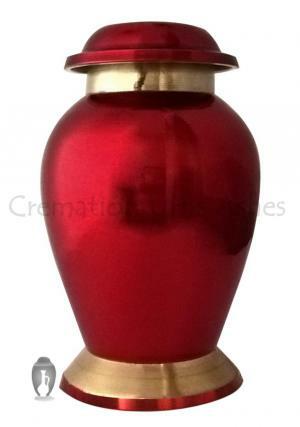 The brass ceremonial urn has a threaded lid on the top for an easy and secure closure.